TV Aerial Simulator was created for GGJ19 for the theme What Home Means to You? by Gavin Wood and John Rooksby. TV Aerial Simulator recreates our fond memories from the 70s of aligning TV aerials to find a better signal. The game is played in VR and needs two or more people to play. One person wears the VR headset and sees an “authentic” 1970s living room and the TV. The other player is the one who would be on a roof. They must move the aerial around to the instructions from the person watching TV to get a better picture. For an authentic experience the person with the aerial should rely just on verbal instructions from the viewer rather than by looking at a screen. The game was inspired by previous GGJ games including Sacred Harvest and Keep Talking and Nobody Explodes. Read more about it on the GGJ19 website or fork the game on GitHub. Imaginary Skip Rope was created for GGJ15 for the theme What Do We Do Now? by Gavin Wood and John Shearer at Lincoln University. 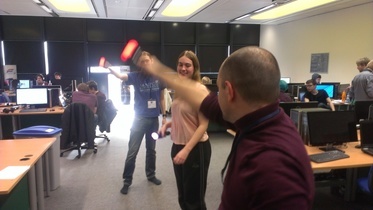 This is game of Skip Rope is played with up to four PlayStation Move controllers. Two people spin the rope using the controllers lit red, while players in the middle (with white controllers) try to jump over the imagined rope. The rope is simulated on the computer and really exists in digital space. We think this is interesting because unlike traditional Skip Rope our game is a little more forgiving, you don’t have to jump high unless want to, and best of all, you use your imagination. As players on both ends of the rope – we become an important part of the game engine. What do we do now? Do we play nice or do we go fast? Read more about our game on the GGJ17 website.